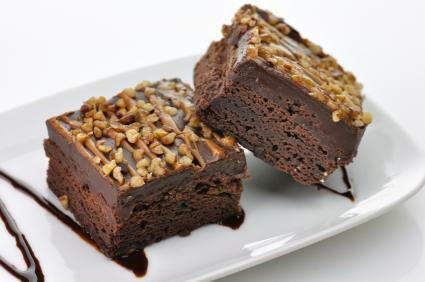 Giving up dairy and eggs as part of a vegan diet does not have to mean you need to give up treats like brownies too. Vegan brownies are often just as delicious as the standard variety, and they are just as simple to make as well. 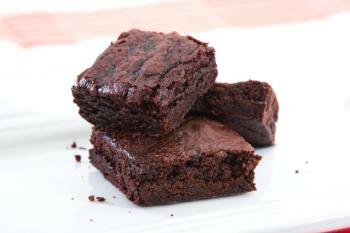 This recipe makes a rich, chewy brownie. They're also so simple you probably already have all the ingredients right on hand. Whisk together the wet ingredients in a second bowl. Slowly add the dry ingredients to the wet and blend well. Pour the mixture into a greased 9 x 13 baking pan. Bake at 350 degrees for 25 minutes or until set in the centers. 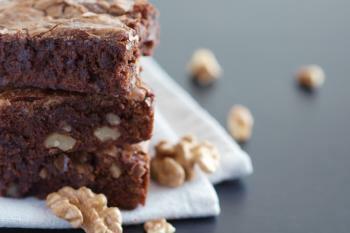 These brownies are loaded with goodies like chocolate chips and nuts. The addition of brown sugar adds a rich, caramel flavor to the finished dessert. Heat the water and 1/2 cup of flour on the stove until the mixture thickens to a paste. Remove it from heat and allow it to cool to room temperature. Mix sugar, salt, vanilla, cocoa powder and vegetable oil in a large bowl. Slowly add the flour and water mixture until well incorporated. Add the remaining flour, baking powder, nuts and chocolate chips, and mix well. Pour into a greased 11 x 7-inch pan and bake for 25 minutes at 350 degrees. Many of Duncan Hines brand cake and brownie mixes are completely dairy- and egg-free. If you're short on time, try using one of their mixes and simply substituting one of the above options for the recommended eggs. Just remember to double check the label to ensure that the mix you are using is dairy- and egg-free. Vegan brownies are one crowd pleaser you can bring with you anywhere. Make a tray whenever you get a chocolate craving and taste how sweet a vegan diet can be.